Actress America Ferrera finally tied the knot. On Monday, she said “I do” to her longtime beau, Ryan Piers Williams, according to Us Weekly. The former Ugly Betty star received from her fiancée a 4-carat diamond ring estimated at a price of 70,000 dollars. Williams proposed to Ferrera in June 2010, and they thought they have waited enough to become husband and wife. The wedding ceremony was held at Chappaqua, New York home of actress Vanessa Williams, who co-starred with Ferrera in the Ugly Betty series. The wedding invitations were honored by a large number of celebrities, singers, actors and entertainers. Among them, there was Blake Lively, the new girlfriend of Leo di Caprio and Ferrera’s co-star in the “Sisterhood of the Traveling Pants” movie. Rebecca Romijn and husband Jerry O’Connell were present as well. Mark Indelicato and Judith Light did not miss it either. 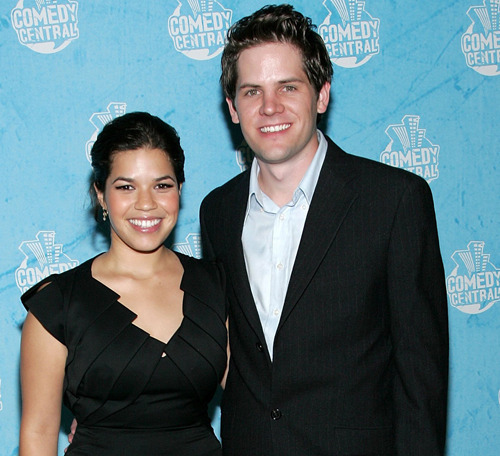 America Ferrera and Ryan Piers Williams first met at the University of Southern California, while they were studying. Williams cast her in a film. They have been living together for five years now and they share the “custody” of a golden retriever named Buddy, whom they call “our baby”. America Georgina Ferrera is best known for her role in Ugly Betty , which brought her a Golden Globe Award for “Best Actress in a Comedy Series” and an Emmy Award for “Outstanding Lead Actress in a Comedy Series”. She has also starred in Real Women Have Curves (2002), The Sisterhood of the Traveling Pants (2005), The Sisterhood of the Traveling Pants 2 (2008), The Dry and (2010) and Our Family Wedding (2010). She has also been the voice of Astrid in the animated movie “How to Train Your Dragon” (2010). Ferrera is the youngest of six children and was born in Los Angeles, California. Her parents immigrated to the United States in the ‘70s from Honduras. Her mother was the manager of the cleaning staff for a hotel and was always telling the children how important is to have higher education. Ferrera knew she wanted to be an actor from a young age, when she was cast in school plays, such as “Hamlet” and “Olivier!”. Before becoming famous, she didn’t like the name “America” and was known to all as Georgina.